On Oct. 2, 2018, the City of Waterloo approved the region’s newest and most eco-friendly mode of transportation: electric scooters. These scooters are in town for the first pilot of the program, running from Oct. 2 to Nov. 30. The trial is being conducted by regional council, with the goal of examining how they fit into the rest of Waterloo’s transportation system, as well as observing the efficiency of the restricted trail of scooter use being instated. Lime, the California-based company that has provided the City of Waterloo with the scooters, has already opened up their market internationally, with urban areas in the United States and Europe exploring and adapting to the innovative design. There are currently one-hundred scooters available for use in the region. However, use of the scooters is being regulated under certain qualifications; such as having a valid driver’s license, the use of a helmet, as well as being 18 years of age or older. The success of this pilot will be measured by the ability of Waterloo to create a permanent and growing presence of scooters and routes, as well as making it as accessible to consumers as possible. The route, which designates scooter usage, currently extends from the David Johnston Research and Technology Park to the Waterloo Park Promenade. The route is subject to change throughout the pilot with anticipation to extend it. “They are not to be used on roads, university campuses and sidewalks … we really ask everyone to be mindful and respectful on the designated routes,” said Ryan Mounsey, senior economic development advisor at the City of Waterloo. The scooters must be parked in designated hubs located along the trail, which are marked by blue signs. The initial unlocking fee for this pilot is $1.00 plus 30 cents per minute, making their usage relatively affordable. As the initial weeks of this pilot commence, the region is beginning to analyze some of the data made available. “On a weekly basis we’ll be receiving more data to understand what user patterns are like,” Mounsey said. “We’re looking at things like trip volume, average length of trip [and] is there some impact on retail in terms of exposure”. Currently, electric scooters do not have a place under the Ontario Highway Traffic Act. However, the regulation of their use is still applicable to the Criminal Code. The region hopes to further create success for the program by “using the information that we gain to help shape transportation policy,” Mounsey said. 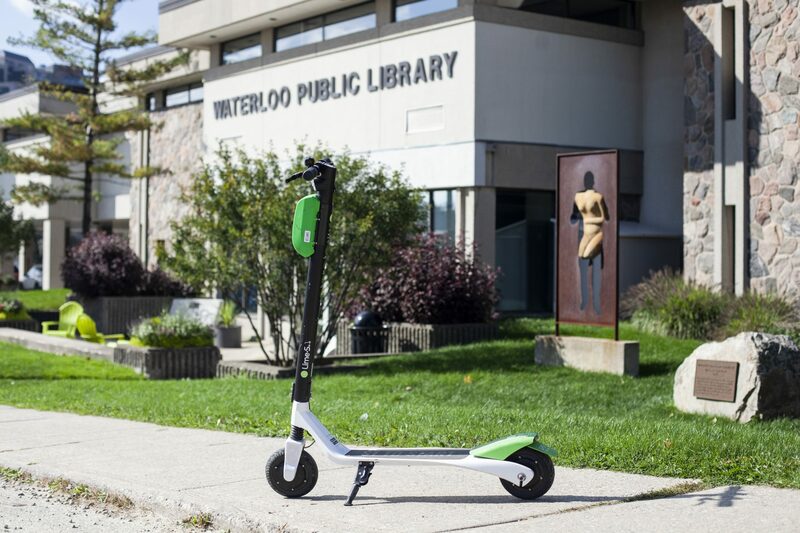 The City of Waterloo urges riders to keep the scooters off of roads, sidewalks and LRT transit routes. Additionally, to walk these scooters across roads and tracks, be respectful of both pedestrians and automobiles and obey the regulations of scooter use.